"In their clothes" explores a hybrid relationship between nature and the detritus of technology. The ubiquitousness of plastic in our daily lives leaves a toxic debris which can be almost mitigated by the seductive, uneasy beauty that it creates. 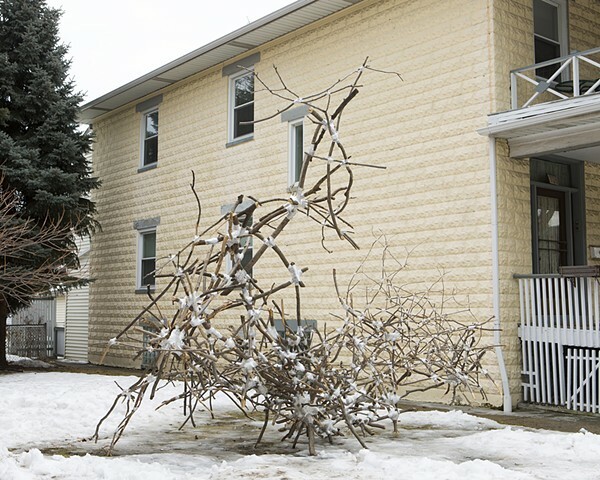 Using tree branches and shrink wrap, the structure of this installation merges rhizomatic and anthropomorphic forms. It evokes traces of consumerism intertwined with the natural world, inviting the genetic possibility that nature's limbs can be synthetically clothed .